Improving cancer control outcomes is a complex process that requires integrating research with both practice and policy priorities at the national, regional and local levels. It requires data from surveillance systems to set priorities and track progress, appropriate and standardized metrics to measure progress, and pragmatic research to identify evidence-based interventions that can be translated into practice and policies adapted to the local context. Dissemination and implementation research further facilitates the integration of research with practice and policies by studying the processes for integrating the lessons learned from science with the lessons learned from practice and policy. 1. Operations research in cancer control. 2. Research, practice, policy partnership models. 3. Moving from evidence to practice: The case of the Women’s Cancer Initiative. 4. Implementation science and health economics in the context of cancer control. 5. How to take advantage of NIH implementation science funding opportunities to rigorously evaluate the implementation of cancer control programmes in Latin American, African or Asian countries. Key issues raised included: the importance of practical measures, including health economics, that can show progress towards short-term goals for gaining support for cancer programmes and policies; the need to develop the field of health economics in Latin America and other LMICs; the need to ensure input from relevant stakeholders in pragmatic research so that findings are relevant to the needs and challenges of specific populations or settings; the need to understand the processes of how evidence-based interventions are successfully implemented through communities of practice that include researchers, practitioners and policy-makers; and finally the need for more funding and greater government support for cancer control research. Developing and implementing practical measures for setting priorities and tracking progress of cancer control plans and programmes. Identifying appropriate evidence-based interventions and policies. Understanding the processes for successfully implementing evidence-based interventions. Cancer control planners and decision-makers rely on data as a basis for setting priorities and tracking progress but the quality of data systems vary. Standardized surveillance systems for collecting and reporting incidence and mortality data are critical for cancer control planning. Most high-income countries (HICs) have these surveillance systems and many low- and middle-income countries (LMICs) have set the development and/or improvement of registry systems as a goal in their national cancer control plans. However, in addition to the standard surveillance systems, practical measures that are brief, easy to collect over time and sensitive enough to assess change in a short period are necessary. To help inform policy-makers, the measures should have national norms, be easily understandable and actionable (2). In addition to quality data, a significant challenge exists in identifying appropriate evidence-based programmes and policies that can translate into practice. Traditional research studies rely on randomized control designs that test the efficacy or effectiveness of an intervention; however, while important, the traditional randomized study design limits generalizability. The majority of programmes and policies tested in a research setting do not readily translate into real world settings and those that do take a very long time to do so (3). For research to influence practice and policy, understanding context concerning implementation is fundamental. This can be a challenge since context can vary and occurs at many levels (e.g., organizational, local, community, regional, national) and is influenced by many factors (e.g., political, environmental, economic). Pragmatic research that incorporates contextual, real-world factors is gaining support as a method for more rapid integration of research into practice and policy. Pragmatic trials include practitioners and decision-makers in developing the research questions so that the results can help answer questions that are most relevant to them and are more likely to translate into practice and policy solutions (4). Dissemination and implementation research further facilitates the integration of research with practice and policies by studying the processes for moving research into practice and policy change. This includes studying strategies that effectively, equitably and efficiently implement health policies and guidelines as well as evaluating policy and other contextual factors that influence successful implementation or dissemination efforts. Moving research into practice requires an understanding of issues and barriers at a local level, which requires stakeholder engagement and community-based participatory research approaches. ICCC–5 Session 5 on “Integrating research, practice and policy priorities to improve cancer control” comprised three plenary presentations to provide an overview of the subject matter as a means of preparing congress participants for participating in five, small group, interactive workshops on relevant topics to be addressed in greater depth. Selected abstracts providing particular insights into the topic area were presented orally by the authors in each of the workshops. Workshop leaders were encouraged to conclude their workshops with a brief set of prioritized recommendations to identify the key directions for further development of interventional activities beyond this congress. Operations research in cancer control. Research, practice, policy partnership models. Moving from evidence to practice: The case of the Women’s Cancer Initiative. Implementation science and health economics in the context of cancer control. How to take advantage of NIH implementation science funding opportunities to rigorously evaluate the implementation of cancer control programmes in Latin American, African or Asian countries. In this plenary presentation, the question “if research evidence is to influence practice and policy then how must practice and policy priorities and conundrums also influence research questions and study designs?”(5) was addressed. Critical to making research-based evidence relevant to practice and policy knowledge users, is how research methods can integrate national, regional and community contexts into study designs so that the external validity of study findings is given as a high a priority by scientists proposing and reviewing studies for funding or publication as are the internal validity of the findings. Research resource information from the region was examined with respect to regional cancer control priorities, and international research, practice, and policy partnership models were discussed. 2. How is policy influenced beyond the health perspective? This presentation focused on the challenges and opportunities in Latin America around the practical application of health economics and discussed the broader context of policy planning in the region as it relates to plans for cancer control. One particularly important hurdle in Peru and elsewhere for the application of health economics is the availability, generation, and use of health data. Peru’s Plan Esperanza is an opportunity to reverse-engineer a policy programme to build a more comprehensive package of interventions for cancer control nationally. The limited role and inconsistent application of health economics in health decision-making in Latin America and examples of growing trends in research, practice and policy knowledge exchange opportunities being supported by countries were discussed. For example, the application of health services research to cancer in Peru and the growing capability in the region to perform health technology assessment and expansion of universal health coverage were discussed. The region faces many challenges due to a lack of specialists in health economics, and a deficit in data to facilitate evidence-based decision-making. There are, however, examples of successful models, including Chile and Brazil, for research, practice and policy partnerships that could possibly be translated to other countries within the region. In conclusion, the need to cultivate the specialty of health economics for the continued improvement of our health systems depends on this kind of expertise. Finally, all of these approaches are applicable more broadly than cancer, and are big ideas that are no longer debatable. Most importantly, cancer control planning must become an annual activity so that new ideas and evidence can foster new programmes for investment. Clinical research influences daily practice and supports the implementation of improvements in the management of patients. Translating scientific results into clinical practice leads to the adoption of well-designed, evidence-based strategies for patient diagnosis, treatment and follow-up. Scientific rigour, respect for the patients’ rights, adoption of good clinical practices, analysis of results and the results themselves can be immediately incorporated into daily practice. Supervision and follow-up of patients is essential to establish critical points, timing analysis, time windows and contingency plans within the overall care plan. Today, well-informed patients are very much engaged in their therapeutic decisions. Oncologist involvement in clinical research establishes the awareness, knowledge, confidence and trust to present options and alternatives within the decision process. In conclusion, optimal patient care requires incorporation of research findings into clinical practice through harmonized patient, professional and health system policy. Meaningful and reliable measures of performance are a critical tool in the efforts to improve the quality of health care systems. In cancer control, where a broad range of strategies are employed to reduce the burden of cancer on the population, from prevention and screening, to diagnosis and treatment, to supportive and end-of-life care, performance indicators can help shed light on where the biggest opportunities for improvement are. Performance measurement at a system level requires routine collection of valid and reliable data, which in turn requires sophisticated standardized data collection and repository infrastructure. This is often a challenge, particularly for countries with rudimentary registries and very little in the way of data on interventions and patient outcomes. This workshop explored how quantitative and qualitative approaches can be used for measuring and evaluating the cancer control system in three different settings: a targets monitoring effort at the international level, a comprehensive national system performance reporting system in a HIC, and foundational measurement and reporting in a LMIC. The first abstract presented a framework to measure and monitor countries’ progress towards achieving the World Cancer Declaration targets. The second abstract outlined the development of a national cancer control system performance programme in Canada and presented examples of indicator results and how they are used to set targets. The third abstract provided the early results of efforts to measure service utilization in Peru using the local insurance database. How do you get to the stage where you can collect and report on useful data for measurement and evaluation in a system with poor data resources and/or disparate data standards? In your country, what has been the response to efforts to measure and evaluate progress towards achieving cancer control objectives? ‰In your experience, what strategies have proven successful in facilitating acceptance and uptake of performance measures and targets by clinicians, administrators and policy-makers? To conduct an assessment of international cancer control efforts benchmarked against the 11 World Cancer Declaration 2020 targets. Data collected from a 2007–2008 study illustrated that the global cancer community lacked the capacity to galvanize around key cancer issues. In 2009, a formal call for commitments was launched, aligning with the World Cancer Declaration targets and modelled on the Clinton Global Initiative commitment process. Between March–July 2009, 350 commitments from advocates, NGOs, corporations, world leaders and health care practitioners in 68 countries were submitted. In August 2009, stakeholders were convened for advocacy and programmatic capacity- building. In 2010–2011, two rounds of self-reported data collection were conducted through an online survey assessing progress against the World Cancer Declaration targets in specific categories including people trained, programmes created, people reached, partnerships created, new/changed policies, research projects established, dollars raised and dollars awarded. One hundred and sixty-seven completed follow-up surveys from 134 unique organizations and health care practitioners were submitted. Results indicate that stakeholders directly affected 5,056,652 lives through services and interventions and indirectly affected 246,835,971 lives through education and awareness efforts. Significant progress is being made towards achievement of the World Cancer Declaration targets, specifically towards target one (creation of sustainable delivery systems), target five (improving public attitudes and dispelling myths), target six (improvements in detection) and target 11 (improvements in survival rates). However, capacity-building in monitoring and evaluation for NGOs and creation and collective use of a more standardized measurement framework are critical to reflect the continued evolution and growth of global cancer control. It is increasingly important for civil society organizations to assist national cancer programmes, particularly as government leaders are called to meet new global goals for NCDs. Progress on the Global Monitoring Framework on NCDs will need to be measured and this data provides a model for such measurement. While most cancer control jurisdictions in developed countries and many in developing countries regularly collect and report standard surveillance data (such as incidence and mortality rates) there are very few examples of comprehensive system performance efforts that provide country-level data across the continuum from prevention and screening, through diagnosis and treatment, to survivorship and end-of-life care. One of the key barriers to reaching this goal has been the challenge of building comprehensive administrative data collection and repository systems. While this may seem a daunting task in many places, the Canadian experience suggests substantial progress can be made over a relatively short time period given a focused effort and a collaborative approach. Over the last five years, the Canadian Partnership Against Cancer’s (CPAC) System Performance initiative has worked in partnership with provincial cancer programmes to systematically build a national programme for reporting cancer control indicators. The work started in 2008 with very little in the way of standardized country level data beyond registry-based surveillance metrics and some wait times data. The first system performance report published in 2009 provided data on 17 indicators but kept the provinces anonymous. The report was not positioned as a report card but rather a resource for identifying best practices and opportunities for improvement. This positioning, along with the deliberate collaborative model, helped cultivate trust in the process among the provincial cancer authorities, which led to the 2010 report openly identifying provinces and also adding indicators on diagnosis and treatment practice. The 2011 report then moved to measuring interprovincial variations in concordance with evidence-based guidelines. By 2012, the provinces were asking for targets and benchmarks to be added and for measurement to be expanded to new domains including patient safety and system efficiency. This progressive building of trust in the process was accompanied by increased proficiency in data management and indicator development leading to progressively more sophisticated metrics and analyses planned for the 2013 and 2014 reports. The presentation outlined the Canadian system performance journey from modest data capabilities and limited experience in interprovincial collaboration on performance measurement among provinces to the sophisticated knowledge products and processes we have today. Results from a number of key indicators were also shared along with work underway to develop performance targets and quality improvement initiatives. To review the medical care (outpatient care, hospitalization, surgery, chemotherapy and radiation therapy) provided to patients through Comprehensive Health Insurance (CHI) in the first four months of 2013. A total of 29,566 patients received care in this period, of which 16,189 (54.8%) were CHI patients. In this group 3,370 (20.8%) cases were diagnosed in 2013, 4,595 (28.4%) in 2012, and 8,224 (50.8%) in previous years. During the study period, 2,355 surgeries were performed, including 1,765 (75.0%) in the CHI group. Of these surgical procedures, 43.3% were for high-cost diseases, including breast, cervical, stomach and colorectal cancers. During the study period, 4,012 patients were discharged from the hospital, including 2,959 CHI patients (73.8%), of which 53.7% were from high-cost diseases, e.g., leukemias, breast and cervical cancers. There were 90,193 clinical consults, of which 69.7% (62,859) were CHI patients. Breast, cervical, stomach cancer, leukemias and lymphomas were the leading diagnoses. Radiation therapy facilities were used by 83.3% of CHI patients in this period. Cervical and breast cancers were the most common cancer types, with other frequent sites being lymphomas and prostate cancer. Outpatient chemotherapy facilities (children and adults) were used by 16,475 patients; 88.5% were in the CHI population. Leukemias and breast cancer were the leading cancer types requiring chemotherapy. While enormous amounts of new cancer control knowledge have been generated worldwide, driven in large part by public sector and some private sector research investments from HICs, relatively little has been invested to translate the lessons learned from science into policy and practice (7). The slow uptake of evidence-based intervention approaches in HICs has been recognized as dissemination and implementation or knowledge translation and exchange challenges. While a growing recognition of these challenges has taken hold in HICs (8–11) the challenges in LMICs are even more complex. In LMICs, many of the research findings emerging from HICs may often be viewed as context irrelevant (12), and the public resources for supporting context-specific research are much more limited. Private sector research funding often is the dominant player in LMICs, and these funds tend to focus on clinical research questions rather than broader cancer control practice and policy questions (13). For both HICS and LMICs growing repositories of research (e.g., PubMed) combined with modern communication technologies (e.g., the internet) means that an enormous amount of research information is available seven days a week and 24 hours per day. An unintended consequence of this may be a signal to noise ratio problem with too much information being processed with too little time to contextualize the information into practical knowledge. One solution to all these challenges is the development of research, practice and policy partnerships (14) that help provide a context by which research findings can be interpreted by knowledge users both for translating the lessons learned from science into practice and to identify practice and policy questions that have not been addressed by the research enterprise and where answers are often urgently needed by practice and policy specialists (15). Research, practice and policy models were reviewed in this workshop. The objective of the National Task Force (NTF) is to enhance the care of AYA with cancer in Canada. Multidisciplinary clinical programmes staffed by trained health care professionals, a systems improvement approach, continuous engagement of all stakeholders and ongoing evaluation and research are all required. The NTF was established in 2008 with the support of the Canadian Partnership Against Cancer and C17 (the consortium of all paediatric oncology programmes in Canada). A developmental approach, combined with disease-specific clinical expertise, is fundamental to achieving the maximal survival benefits, the greatest impact on quality of life and the optimal functioning and productivity of survivors. Two international workshops were held, attended by health care professionals, survivors, administrators, researchers and international experts. The first workshop (March 2010) produced specific recommendations (16). The second workshop (March 2012) produced a framework for action to implement those recommendations (17). These included establishment of regional action partnerships to improve active treatment, increased accrual to clinical trials, development of guidelines for active care and long-term follow-up, and provision of age-specific psychosocial supports. Other initiatives include development of an evaluation process including economic metrics, the creation of an AYA cancer diploma programme administered by the Royal College of Physicians and Surgeons of Canada, a programme of collaborative AYA research and a knowledge translation and exchange strategy. The NTF continues communicating and working with all stakeholders to activate its recommendations and action plan. This inclusive process will influence and improve the cancer control paradigm for AYA with cancer and AYA survivors of cancer in childhood, adolescence and young adult life in Canada. CLASP is a funding initiative of the Canadian Partnership Against Cancer that brings together organizations across two or more provinces and/or territories and research, practice and policy experts to work together to broaden the reach and deepen the impact of evidence-informed interventions for cancer and chronic disease prevention. The seven projects funded in 2009 for three years involved over 1,100 individuals and organizations, including 53 research, 232 practice and 119 policy experts, with other non-health sectors. The project interventions impacted over 142,000 individuals and organizations across every province and territory in Canada. The 172 interventions implemented by the seven projects aimed to change or improve environments, change individual behaviours, influence policy, legislation or regulations and influence provision of health or social services. Municipal planning software developed in British Columbia that demonstrated how built environment planning would lead to an 86% increase in active trips/person/day, 102% increase in cycling to work/school and 10% increase in daily energy expenditure. Implementation of a SipSmart! school curriculum in the Northwest Territories resulted in a student-reported 8% decrease in the consumption of sugar-sweetened beverages after completing the programme. Family practices with a prevention facilitator delivering patient-level prevention and screening interventions in Alberta and Ontario accomplished a statistically significantly increase (approximately 2.5 times) in their eligible screening and prevention targets compared to control practices not participating in the intervention. Cross-CLASP evaluations of 124 coalition members indicated a statistically significant transition within coalitions from networking and coordination to cooperating and collaborating. The CLASP coalition model has been able to leverage what is working in one province or territory and transfer it to others. CLASP continues as a CPAC funding initiative with additional projects recently funded for a three year implementation period. Current interventions for cancer control were generated according to scientific evidence for prevention, detection, diagnosis, treatment and palliative cancer care. However it is critical that scientific evidence be generated in a systematic, orderly way and in collaboration and coordination with collaborative research groups with more experience. To facilitate the development and operation of collaborative research groups in the region of Latin America to set cancer research priorities. The process for identifying research priorities in oncology was through workshops with researchers and doctors to enable more efficient use of resources. Concurrently, INEN established partnerships with other regional cancer research institutes to implement and strengthen oncology research. INEN has established strategic alliances with the National Institute of Health of Peru, the leading research institute in Peru, the National Cancer Institute (USA) and South West Oncology Group (SWOG), thereby allowing INEN to strengthen and develop cancer research priorities in Peru, including public policies, preventive vaccines, healthy lifestyles, diet, physical activity, infections, prevalence of modifiable risk factors, molecular epidemiology, environment and cancer, methods of early detection and timely diagnosis, molecular classification of patients to evaluate predictive factors for treatment, systemic treatment, surgical and radiation therapy, psychoemotional support, effective and innovative interventions for nursing care, pain management protocols, strategies for rehabilitation and social reintegration, cancer burden and innovation in the training of professionals in oncology. The next step is more economic support through our cancer control and prevention planning. Some reports indicate that rates of occupational and environmental cancers are being underestimated, despite the 111 carcinogens known to be related to them. Registration and notification of cancer cases are hampered by long latency periods between exposure and disease, the difficulties in assessing exposure, low technical training for diagnosis and inattention to details of occupational exposure. Accurate determination of exposure risk, disease causality and implementation of an effective surveillance system are required to address occupational and environmental cancers. Present and discuss strategies used in successful national intersectoral actions for the investigation of carcinogenic agents. Occupational and environmental risk factor investigation projects were carried out on populations exposed to carcinogens in three rural counties in southern Brazil (2007–2012). One proposal was to implement a pilot study in a tobacco-grower county to subsidize strategies linked to the Framework Convention on Tobacco Control. This work was implemented by the National Cancer Institute with the participation of sections of the Ministries of Health and Agrarian Development, as well as support from the State and Municipal Health Secretaries. This partnership project has been a successful experience. Each partner institution is fully aware of their role and of the precise time for their engagement. The flow begins with federal coordination and moves towards state and municipal levels, where the network of well-trained family health teams reaches the target population, captures information and performs the necessary interventions. Thereafter a counter-flow is established ensuring the return of information and materials. At the end of the process, feedback of the results is given to the population by means of discussion forums and local surveillance strategies are adopted. In a country with scarce health resources like Brazil, optimizing previously established health networks ensured the success of the investigation project and the implementation of a surveillance programme. Worldwide, breast and cervical cancer are the most common cancers among women, and the majority of these cancers are in LMICs (18). Recent research has defined the cause of cervical cancer and technologies have been developed for prevention, notably HPV vaccines, screening tests including HPV DNA tests, cervical cytology, visual inspection with acetic acid (VIA) and cryotherapy for treatment of precancerous lesions. Although less is known about breast cancer, ongoing research is contributing to the development of new treatments and to the evidence base for education and awareness, patient empowerment, clinical breast examination and mammography screening for early detection and improved patient outcomes. However, the application of this evidence and these technologies, especially in LMICs where the burden of disease is greatest, has not been as rapid or as large-scale as needed to reduce mortality. 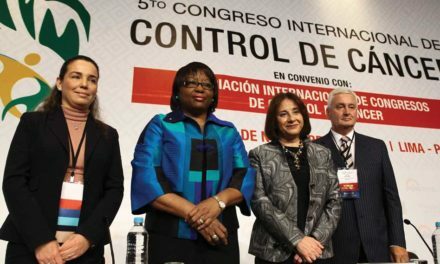 The WCI was created to spur international cooperation and partnerships within the Americas region, to support countries in Latin America and the Caribbean to accelerate the deployment of technologies and evidence for breast and cervical cancer prevention and control. 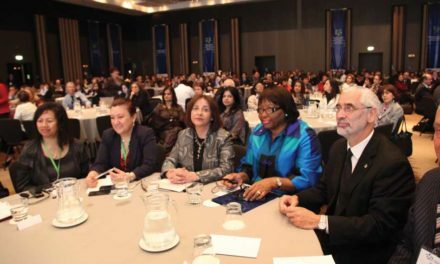 The WCI, led by PAHO and involving over 20 partners from governments, nongovernmental organizations, academia and the private sector, offers a case example of how evidence can be promoted and new knowledge shared so that public health programmes can be improved by integrating evidence-based technologies. Workshop presentations included Argentina’s national cervical cancer programme, results of a review on the application of the Breast Health Global Initiative guidelines and the work of the Network of Cancer Institutes of South America (RINC). Enabling factors and barriers influencing the incorporation of new knowledge into public health policies and programmes for breast and cervical cancer prevention, screening and treatment and how the WCI can be leveraged to improve policies and programmes in their country were discussed. In Argentina, cervical cancer mortality has been largely unchanged for the last 30 years despite the availability of cervical screening for more than 50 years. The National Program on Cervical Cancer Prevention (NPCCP) was re-launched in 2008 with the objective of strengthening provincial programmes, achieving high screening/ diagnosis/treatment coverage and developing an information/monitoring/evaluation system. Agreements between national and provincial governments were signed in 10 provinces in order to get consensus about the political priority of cervical cancer prevention and to coordinate activities. Communication/information strategies were designed for women from different regions and social backgrounds. Special emphasis was put on working with health professionals and authorities to increase adherence to programme guidelines (i.e., age/interval of screening, laboratory centralization). Cytology laboratories were newly equipped and in-service training took place in 12 laboratories from eight provinces, involving more than 95 staff. A team of navigators provided support to women with precancerous lesions through the diagnosis/treatment process. SITAM (Information and Monitoring System for Screening) was implemented to monitor/evaluate programme performance and is currently in use in 19 provinces. In five provinces, main laboratories have doubled the number of read smears, decreased the percentage of unsatisfactory Paps and improved turnover-time. In 2011, the country initiated a demonstration project to introduce HPV-testing for primary screening as part of an integrated approach to prevent cervical cancer that also includes HPV-vaccination for girls beginning at 11 years of age. The goal is to HPV-screen 22,000 women annually over three years and reach 80% coverage. During 2012, 22,589 women aged 30+ were screened, with a positivity rate of 12.7%. Among those, 921 had an abnormal Pap smear. Based on these results, HPV testing is being extended to other provinces. The NPCCP demonstrates the importance of an integrated approach to achieve an impact upon cervical cancer. Resource constraints in developing health systems require difficult allocation decisions to optimize cancer outcomes. Cancer care guidelines developed in high-income countries have limited utility in LMICs because many of the resources described in the ideal health care delivery system are unavailable or unaffordable, making it unclear where to begin in creating a realistic and sustainable cancer control strategy. New approaches to health care system design require that an evidence-based approach to resource prioritization be established. Documenting how many times each BHGI guideline has been cited (to assess the impact of the guidelines). Identifying the application of each guideline in terms of where (regions or countries) and when (year of citation after the publication of the guideline) the citation occurred. Ascertaining the purpose of the use of the guideline in the corresponding article in which it was referenced. Evaluating trends in citation among the different guidelines, to understand what information has been more relevant for limited-resource countries. Cervical cancer is the second most common cancer among women in Latin America, ranking first in some countries, with about 68,220 new cases and 31,712 deaths. Despite many initiatives in Latin America against cervical cancer and the introduction of early detection programmes, mortality rates from cervical cancer have not declined. Barriers to participation in cervical cancer screening vary in different countries. The Network of National Cancer Institutes (RINC), organized under the auspices of the Union of South American Nations (UNASUR) seeks to align public cancer prevention and control recommendations and policies and share programme experiences that have been successful and that might be adapted and implemented by other network members. RINC member institutions are working together to address a number of challenges in cancer prevention and control, but have prioritized cervical cancer. Providing a platform for technical exchange and consensus-building among member countries thereby strengthening prevention and early detection programmes. Reducing the incidence of and mortality from cervical cancer. An important virtue of the cooperation is that the consensus-building process serves to guide and validate what network institutions seek to do in their own countries, giving them greater credibility with other stakeholders. American Health Organization/World Health Organization (PAHO/WHO), the US Department of Health and Human Services and the American Cancer Society to create the Cervical Cancer Prevention and Control Project for Latin America and the Caribbean which aims to reduce cervical cancer incidence and mortality through outreach to women in the region. Given limited resources, decision-makers must consider the additional costs and value added of implementing new cancer control or prevention interventions. The field of dissemination and implementation research includes a focus on developing user-friendly tools and information to help decision-makers understand the tradeoffs between costs of adopting and implementing evidence-based programmes and expected health outcomes associated with new interventions. Several economic evaluation methods (e.g., cost-effectiveness, cost-benefit and cost-utility analysis) can be employed for this purpose so that data from these types of studies can be used to influence decision-making. There is an urgent need to translate evidence-based intervention programmes into practice to reduce cancer morbidity and mortality; yet there are multiple competing demands that limit the ability for organizations to readily adopt and implement evidence-based programmes. Shifts in current research and practice are needed to increase the use of economic information to accelerate adoption, implementation and maintenance of evidence-based interventions for cancer control. First, while intervention trials more frequently include studies of intervention costs, cost-effectiveness, and budget impact, there is still an urgent need to make these types of measures and studies standard practice. Contextual factors, including organizational capacity, resources and infrastructure are also needed so that the results of economic evaluations can be interpreted appropriately and the potential for dissemination to new settings or population groups can be adequately assessed. Second, if this information is not made available to decision-makers following the completion of such studies, it cannot be used to facilitate adoption and implementation decisions. Therefore, it is essential to provide individuals responsible for making resource allocation decisions at the clinic, county, state and federal level with accurate information on the cost of implementing new interventions. Researchers at the MD Anderson Cancer Center and the University of Texas School of Public Health are currently developing an innovative tool to help low-resource primary care clinics decide if they want to adopt an evidence-based tobacco cessation programme. Decision-makers at federally-qualified health centres and rural health clinics in Texas will be able to use this online tool to understand the cost implications of adopting and implementing Ask-Advise-Connect (AAC), an evidence-based tobacco cessation programme. Using the electronic health record, AAC prompts clinicians to assess the tobacco use status of every patient 13 years of age or older, advise him/her to quit and connect interested tobacco users directly and electronically to the Quitline. This tool will not only translate the findings of cost-effectiveness and budget impact information from previous studies but will do so in a format that will allow decision-makers to estimate clinic-specific costs and budget impact using their own data. Additional research is needed to test how these types of tools can be tailored to the needs of primary care professionals, and how they will be able to modify the key parameters of the model in real time depending on patient-, provider- or system-specific characteristics. Although the tool is being tested in the context of tobacco cessation, it can be applied to the planning and application of other cancer prevention activities. Approximately 80% of hepatocellular cancers (HCC) worldwide are attributable to chronic viral hepatitis and are largely preventable, yet liver cancer remains a leading cause of cancer death in the Asian region and among migrant populations born in countries where chronic hepatitis B (CHB) infection is endemic. Although antiviral treatments can reduce HCC incidence, low disease awareness among affected communities and health care providers, logistical challenges, resource limitations and low policy priority preclude population-level approaches to disease control even in well-resourced settings. The B Positive programme is a targeted, multi-pronged intervention aiming to reduce CHB-related HCC in high risk migrant communities in Sydney, Australia, where a rapid increase in HCC incidence recently propelled an uncommon cancer into the top 10 causes of cancer death. It combines community and primary care education and support with a CHB Registry which optimizes patient management and informs policy, practice and advocacy. The programme was informed by economic modelling showing that antiviral treatment for CHB is much more effective and cost-effective than primary liver cancer screening. The challenges arising from attempting to implement a “top-down” pilot intervention led to a wide stakeholder consultation and extensive programme re-design as a community-based programme which is commencing to change practice (see Figure 1). Programme achievements and lessons learnt during programme planning and development of potential relevance to cancer control in different settings were summarized. In 2009 the Peruvian government sanctioned the Universal Health Insurance (SIS) Law to provide financial protection to all Peruvians accessing a fixed set of services. However, poor and extremely poor people had rights to minimal services for cancer prevention and diagnosis. Despite the creation of a Fund for Catastrophic and High Cost Diseases (FISSAL), lack of financial resources, skilled professionals and diagnosis and treatment supplies in the poorest rural areas prevented the most vulnerable people from accessing integrated cancer care. In 2011, the Peruvian Ministry of Health and the National Cancer Institute (INEN) implemented a new model of output-oriented budget and cancer health delivery with new financial resources in five regions of the country for the prevention and early detection of breast, cervix, stomach, colon and prostate cancer. In mid-2012, the Peruvian government’s National Cancer Program for the Poor and Poorest People provided access to preventive care and treatment (radiotherapy, chemotherapy and surgery). At INEN, the percentage of patients covered by public insurance (SIS) increased from an average of 5% in 2003–2009, to 18% in 2010, and 31% in 2011, mostly for risk prevention. It reached 41.1% by September 2012, when INEN and a strengthened FISSAL agreed to the financing of integrated cancer treatment for the seven most frequent types of cancer. In 2013, an increased proportion of poor people have accessed integrated cancer care – 59.46% by May 2013, with nearly 7,000 patients covered for early detection, stage-diagnosis and appropriate treatment. Currently, patients with leukemia and lymphoma are also covered for care including, if necessary, organ transplant by INEN’s agreement with FISSAL (High Cost Sickness). The Peruvian government’s groundbreaking political decision and INEN’s technical leadership have resulted in an inclusive policy that provides integrated quality cancer care for the poor and poorest families. The National Institutes of Health (NIH) are committed to closing the gap between research discovery and community and clinical practice so that all populations can benefit from the investments made in scientific discoveries. As part of the NIH, the National Cancer Institute has dedicated staff in the Division of Cancer Control and Population Sciences that focus specifically on implementation science. Part of the Implementation Science Team’s mission is to build the field of implementation science by growing the number of domestic and international dissemination and implementation research grants submitted for review and increasing the number of domestic and international grants funded by NIH. To accomplish this goal, a number of conferences and training initiatives have been created to support investigators interested in conducting dissemination and implementation science research. NIH has hosted an annual conference on dissemination and implementation research in Bethesda, Maryland since 2007. This two-day conference is open to domestic and international audiences. The conference combines a mix of plenary presentations with competitively selected oral presentations, poster presentations and think-tank sessions focused on an annual theme, such as “research at the crossroads” or “policy and practice in dissemination and implementation”. Interest in the conference has continuously grown with more than 800 individuals attending in 2012. NIH has also co-sponsored an annual Training Institute on Dissemination and Implementation Research since 2011. This five-day training institute is also open to both domestic and international applicants who compete for 35 to 40 training positions. The training provides participants with a grounding in conducting dissemination and implementation science research in health. Faculty and guest lecturers consist of leading experts (practitioners and teachers) in theory, implementation and evaluation approaches to dissemination and implementation, creating partnerships and multi-level, transdisciplinary research teams, research design, methods and analyses appropriate for dissemination and implementation investigations and conducting research at different and multiple levels of interventions (e.g., clinical, community, policy). At the end of the training, participants are expected to return to their home institutions prepared to share what they have learned at the institute to help grow the field of dissemination and implementation research (e.g., giving talks, leading seminars, forming new collaborations, mentoring and submitting grant proposals). NIH has a specific programme announcement (http://grants.nih.gov/grants/guide/pa-files/PAR-13-055.html) to fund dissemination and implementation research which is open to international applications. While training has helped build capacity for domestic researchers successfully competing for dissemination and implementation grants at NIH, the number of international applications has not grown significantly. This was a small hands-on workshop for delegates interested in securing funding for implementation science research. The workshop provided information about research topics and methods to study dissemination and implementation of cancer control programmes and policies. Delegates were encouraged to come to the workshop with a dissemination and implementation research project in mind. An overview of dissemination and implementation research along with information concerning the NIH grant submission process with a focus on international applications was provided. Delegates spent time with facilitators working on potential grant application abstracts and shared ideas for potential research projects with the larger group. Session 5 (ICCC–5) identified opportunities for improving the integration of research into practices and policies in both HICs and LMICs. Traditional surveillance systems are necessary but insufficient for measuring progress in achieving cancer control goals. Practical measures that can show progress towards goals in the near term are critical for gaining ongoing support for cancer programmes and policies. The World Cancer Declaration Targets (19) are an example of implementation of practical measures at the international level. Further approaches were highlighted in Canada and Peru. Health economics data are one type of practical measure that was seen as critical for gaining political support, developing evidence-based policies and programmes and reporting outcomes of interest to the public. Economic analysis should be included from the planning stage through implementation and evaluation of cancer control programmes. Workshop discussion identified the need to develop the field of health economics in Latin America and other LMICs, a role that might be appropriate for regional cancer control groups such as RINC or PAHO. Pragmatic approaches for integrating research into practice and policies through partnership models such as the Women’s Cancer Initiative highlighted the need to ensure input from relevant stakeholders to ensure research findings are relevant to the needs and challenges of specific populations or settings and the necessity to coordinate pilot projects and create forums for testing and applying new interventions to establish consensus, action and implementation of effective interventions. Finally, understanding the processes for successfully implementing evidence-based interventions is necessary for integrating research into practice and policy. One approach is the creation of communities of practice around cancer control programmes and policies that include researchers, practitioners and policy-makers. These communities of practice can provide a space for open dialogue on the realities of moving research into practice, identification of the needs and priorities of the key stakeholders and a place to explore opportunities to collaborate on research designed for real world practice. Funding is important for dissemination and implementation of research findings as well as for studying optimal processes for dissemination and implementation. Given the relevance to population health, greater government support for cancer control research is particularly germane rather than relying on research generated by corporate interests. 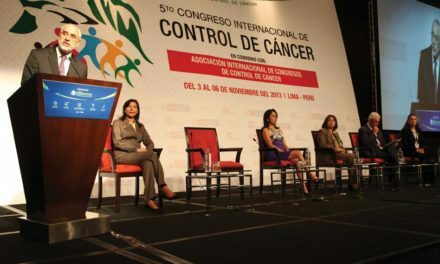 This manuscript is a synthesis of plenary presentations, workshop discussions, including selected abstract presentations, and recommendations for ongoing actions derived from Session 5 of the Fifth International Cancer Control Congress (ICCC–5) held in Lima, Peru, 3–6 November 2013. The ICCC–5 Working Group was made up of Simon B Sutcliffe, Kavita Sarwal and Catherine G Sutcliffe from the International Cancer Control Association, and Tatiana Vidaurre Rojas and Roxana Regalado from the National Cancer Institute (INEN) in Peru. The opinions expressed herein represent those of the authors alone and do not necessarily represent the institutions and organizations by which they are employed. 1. Glasgow RE, Green LW, Taylor MV, Stange KC. An evidence integration triangle for aligning science with policy and practice. American journal of preventive medicine. 2012;42(6):646-54. 2. Glasgow R, Emmons KM. The public health need for patient-reported measures and health behaviors in electronic health records: a policy statement of the Society of Behavioral Medicine. Translational behavioral medicine. 2011;1(1):108-9. 3. Balas EA, Boren SA. Managing Clinical Knowledge for Health Care Improvement. In: J B, AT M, editors. Yearbook of Medical Informatics 2000: Patient-Centered Systems. Stuttgart, Germany: Schattauer Verlagsgesellschaft mbH; 2000. p. 65-70. 4. Patsopoulos NA. A pragmatic view on pragmatic trials. Dialogues in clinical neuroscience. 2011;13(2):217-24. 5. Green LW, editor. Implementation research and practice: If we want more evidence-based practice, we need more practice-based evidence. First Biennial Australian Conference on Implementation; 2012 Oct 25; Melbourne, Australia. 6. Dilts DM, Sandler AB. Invisible barriers to clinical trials: the impact of structural, infrastructural, and procedural barriers to opening oncology clinical trials. Journal of clinical oncology: official journal of the American Society of Clinical Oncology. 2006;24(28):4545-52. 7. Kerner JF. Knowledge translation versus knowledge integration: a “funder’s” perspective. The Journal of continuing education in the health professions. 2006;26(1):72-80. 8. Damschroder LJ, Aron DC, Keith RE, Kirsh SR, Alexander JA, Lowery JC. Fostering implementation of health services research findings into practice: a consolidated framework for advancing implementation science. Implementation science: IS. 2009;4:50. 9. Grimshaw JM, Eccles MP, Lavis JN, Hill SJ, Squires JE. Knowledge translation of research findings. Implementation science: IS. 2012;7:50. 10. McCormack B, Rycroft-Malone J, Decorby K, Hutchinson AM, Bucknall T, Kent B, et al. A realist review of interventions and strategies to promote evidence-informed healthcare: a focus on change agency. Implementation science: IS. 2013;8:107. 11. Oliver K, Innvar S, Lorenc T, Woodman J, Thomas J. A systematic review of barriers to and facilitators of the use of evidence by policymakers. BMC health services research. 2014;14:2. 12. Masmoudi A. The contribution of limited-resource countries to the American Society of Clinical Oncology annual meetings. International journal of clinical oncology. 2009;14(5):442-6. 13. Kerner JF, Cazap E, Yach D, Pierotti MA, Daidone MG, de Blasio P, et al. Comprehensive cancer control-research & development: knowing what we do and doing what we know. Tumori. 2009;95(5):610-22. 14. Manafo E, Petermann L, Lobb R, Keen D, Kerner J. Research, practice, and policy partnerships in pan-Canadian coalitions for cancer and chronic disease prevention. Journal of public health management and practice: JPHMP. 2011;17(6):E1-E11. 15. Kerner JF. Integrating research, practice, and policy: what we see depends on where we stand. Journal of public health management and practice: JPHMP. 2008;14(2):193-8. 16. Fernandez C, Fraser GA, Freeman C, Grunfeld E, Gupta A, Mery LS, et al. Principles and Recommendations for the Provision of Healthcare in Canada to Adolescent and Young Adult-Aged Cancer Patients and Survivors. Journal of adolescent and young adult oncology. 2011;1(1):53-9. 17. Rogers PC, De Pauw S, Schacter B, Barr RD. A Process for Change in the Care of Adolescents and Young Adults with Cancer in Canada. “Moving to Action”: The Second Canadian International Workshop. International Perspectives on AYAO, Part 1. Journal of adolescent and young adult oncology. 2013;2(2):72-6. 18. International Agency for Research on Cancer. GLOBOCAN 2012: estimated cancer incidence, mortality and prevalence worldwide in 2012. Lyon, France: International Agency for Research on Cancer, World Health Organization; 2012 [cited 2014 Jan 26, 2014]; Section on Cancer Information]. Available from: http://globocan.iarc.fr/Pages/fact_sheets_cancer.aspx. 19. Union for International Cancer Control. World Cancer Declaration. 2013 [cited 2014 April 15]; Available from: http://www.uicc.org/world-cancer-declaration.